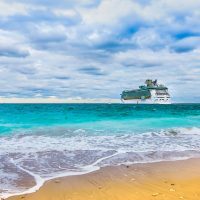 Whether you’re spending your entire family vacation in Nassau or just passing through during your Caribbean cruise, there are plenty of free or super-cheap things to do in the capital city of the Bahamas. As one of the few free beaches in Nassau that’s close to the cruise port, Junkanoo Beach can get crowded. But it offers white, sugary sand and clear, blue waters perfect for swimming and snorkeling. 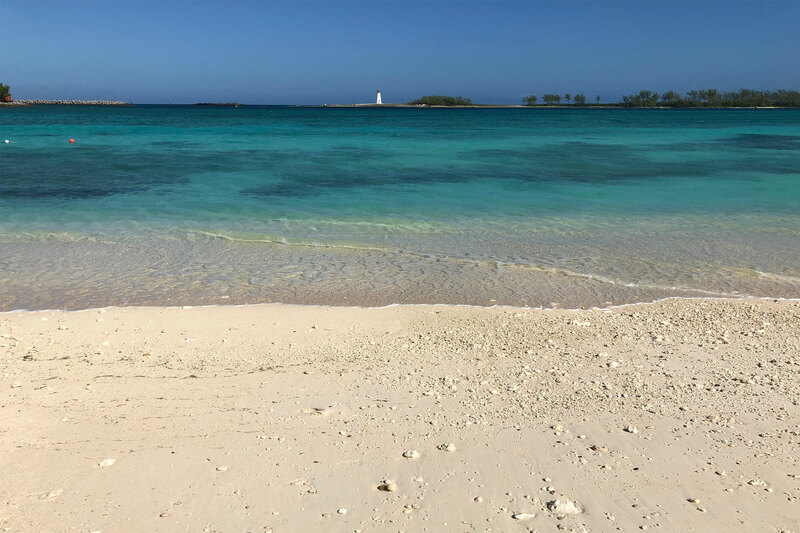 Located at Bay and Nassau streets near Courtyard by Marriott Nassau Downtown/Junkanoo Beach, this free beach is about a 15-minute walk or so from the cruise port terminal. Chairs and umbrellas can be rented from beach vendors and food is available for purchase from beach vendors and restaurants that line the street behind the beach. Restrooms and changing areas are also available at this beach. 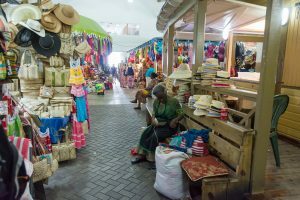 Browsing Nassau’s Straw Market, located on Bay Street, is a must when visiting the area—and it’s free! (Of course, the shopping is another story!) This souvenir market offers everything from straw hats and beach bags to wood carvings and paintings. Be prepared to be approached by the vendors selling their wares, but know that you can haggle for the best price. Located just outside the Straw Market on Bay Street is a courtyard area with splash pad-like spray fountains situated in the center. It’s the perfect place for kids to cool off! There are also shaded areas to sit and put your feet up, plus even more vendors selling goods. 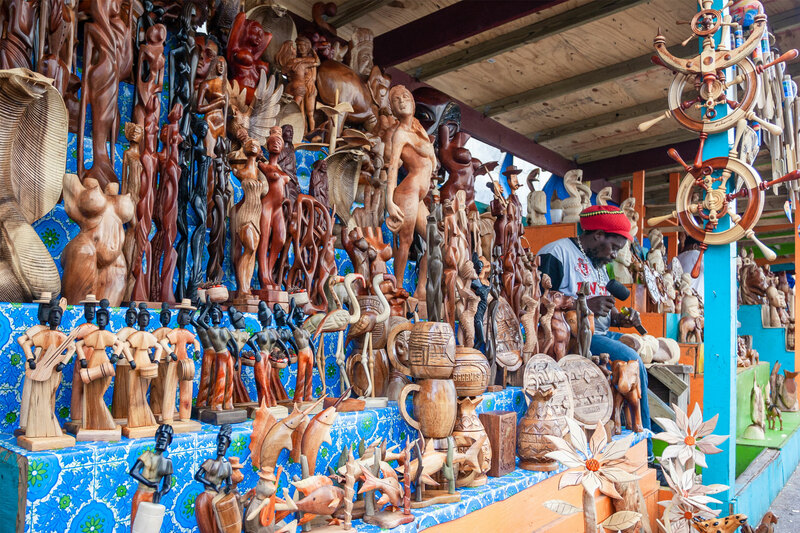 In and around the Straw Market area are vendors selling wooden sculptures and figurines. Families will find some of the craftsman working on their next creations. It’s fun to watch how quickly and creatively they can chisel and hammer the wood. Take a minute to watch and admire the craft at no cost. The 66 steps of the Queen’s Staircase (named after Queen Victoria) were carved out of limestone rock in the 1790s. This Bahamian landmark is a pretty spot surrounded by limestone and greenery, and makes for a great photo opportunity or a place to have the kids burn off some energy, free of charge. 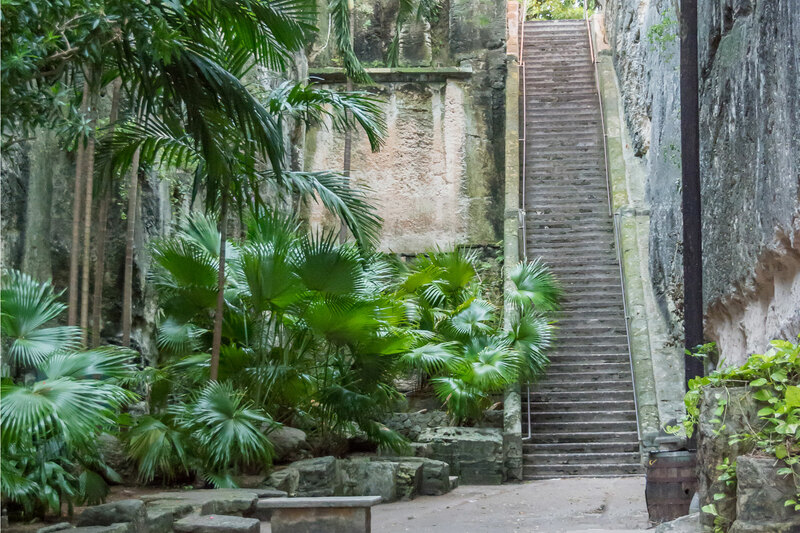 Once you’ve climbed the Queen’s Staircase, you’ll be rewarded with a gorgeous view and the chance to explore a fort that—like the Queen’s Staircase—was cut from limestone in the 1790s. 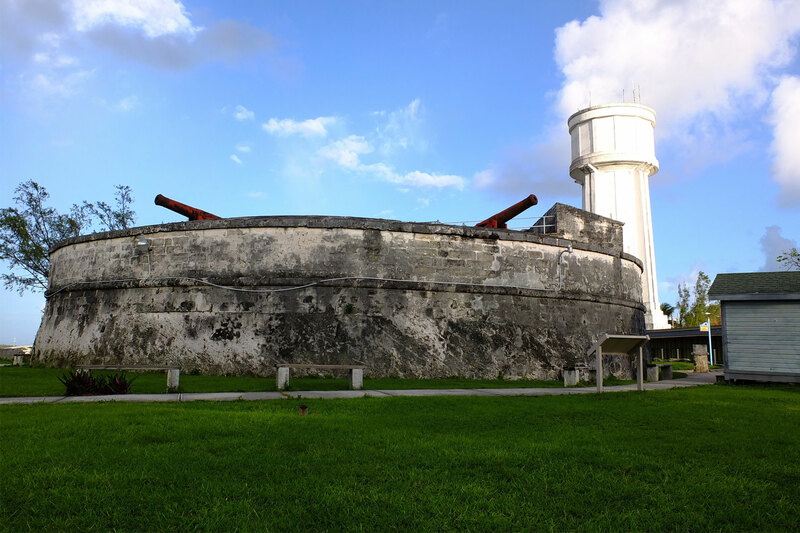 Fort Fincastle overlooks the city of Nassau and Paradise Island, and was actually used as a lighthouse until 1817. Free, guided tours of the fort take place daily from 8 a.m. to 4 p.m.; donations are encouraged. Some cruise lines offer tours of the fort (including transportation) for a fee. Located near the Straw Market and about an eight-minute walk from the cruise port terminal is The Pirates of Nassau Museum. Kids will love to climb aboard the life-size pirate ship and experience what it was like to live like a pirate in the 1700s. The self-guided tour offers plenty of details on the pirates of the Bahamas and how they lived. It takes about 30 minutes to an hour to walk through the museum. There is also a pub onsite, perfect for grabbing lunch after your pirate adventure. Admission for adults is $13.50 and $6.75 for children age 4 to 17. The Ardastra Gardens and Zoo, the only zoo in the Bahamas, is best known for its flamingos. There are more than 200 flamingos at this zoo, and three times daily, these pink beauties march about to say hello to visitors. The flamingos are not afraid of people and are happy to pose on one foot right next to you for a flamingo photo! More than 200 other types of animals can be found at the zoo, including domestic pigs, lemurs, iguanas, turtles and parrots, and they are all surrounded by gorgeous greenery and colorful flowers throughout the 4 acres of tropical gardens. Admission is $18.75 for adults and $9.50 for children age 4 to 12; it’s free for children under 3 years old. 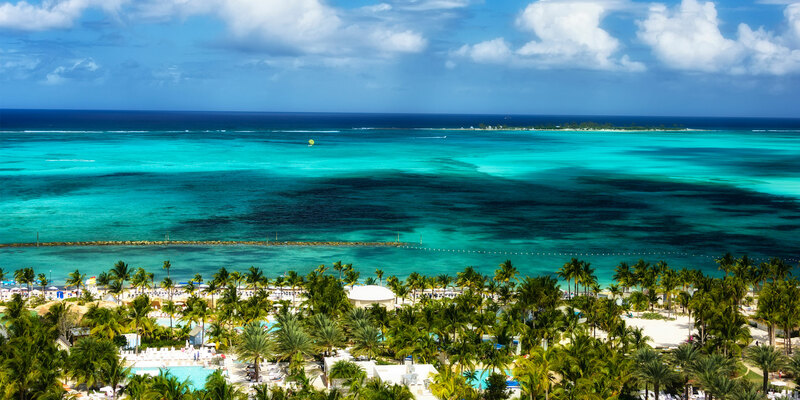 Related: Atlantis vs. Baha Mar: Which Bahamas Resort is Best for Your Family?